There’s no shortage of web designers and developers working on Apple hardware. From part-timers and freelancers to major studios, it’s becoming rare to see a major development company without an assortment of Apple gear in the office. From giant iMacs to the in-need-of-an-update Mac Pro, most designers are quite comfortable with Cupertino’s most well-known company’s hardware. We think it’s something that goes beyond the interface and questionable increase in stability – Macs do have a great assortment of design applications. These fifteen applications are our personal picks, reflecting the best of what Mac OSX has to offer designers, developers, and online workers. Note: Obvious picks like Photoshop, Illustrator, and other Adobe applications have been left out of our roundup. It’s not that we don’t like Adobe (we’re not Steve Jobs), just that we’d prefer to support smaller application developers and suggest less obvious software. Automator could be the computing world’s simplest robotic assistant. Designed to complete basic and repetitive tasks without endless coding, it’s one of the most user-friendly automation apps out there. Describe basic tasks in text, use the application’s built-in automation settings, or simply record yourself completing a task and Automator will copy the task for future use. We like using Automator for repetitive and time consuming tasks – cropping images, saving media, and searching for specific files in Finder. Spend enough time learning how to use Automator and it’s highly likely you’ll run into ways it can optimize the way you work, saving you hundreds of hours each year that would otherwise be wasted on thankless and repetitive tasks. Want to guide users through a tutorial, create a promotional video, or record an interview for your blog? ScreenFlow is a simple screen capture application that gives Mac users the ability to record and save their on-screen activities without endlessly having to adjust settings or wait for footage to save to disc. Sounds pretty standard, right? What separates ScreenFlow from other screen capture applications is its powerful editing suite. After you’ve captured on-screen video, the app’s editor lets users highlight foreground windows, blur out unnecessary background details, and add on-screen information to their video. It’s free to try and $99 to buy, but believe us when we say it’s worth it. Need to code? TextMate is our preferred text coding tool – it’s simple, incredibly user-friendly, and one of the most intuitive hand coding applications available on any operating system. The program itself is equal parts text application and GUI, giving developers and old fashioned designers a wide range of options for completing their projects. What makes it better than Apple’s own TextEdit? First, it’s great for highlighting and differentiating between on-page tags and different code snippets. Second, it has one of the most effective and quick searching tools we’ve found on any text editor. Finally, it’s good for more than just handwritten code and development projects – we could quite happily use TextMate for notes and rough documents. Photoshop is expensive. GIMP is ugly. Pixelmator, on the other hand, is one of the most beautiful and inexpensive image editing applications to hit the Mac, and it’s damn powerful to boot. Unlike other cross-platform apps which use the Mac’s hardware as a secondary feature, Pixelmator is built from the ground up for Mac hardware, blending in effortlessly with Spotlight and other Mac-only applications. It’s a steal for designers too, priced at just $59 and inclusive of free updates. While we could never give up on Photoshop for image editing and site design, Pixelmator certainly is tempting. The app itself is absolutely beautiful, providing designers with plenty of inspiration while they’re working. Airlock isn’t an essential app for designers, but it is pretty cool. This micro-application lets iPhone users lock their Mac automatically when they walk away from it using the phone’s Bluetooth signal as a proximity guide. Configure the app properly and you can lock Mac OSX once you move fifteen meters back, or even set up Airlock to require a password once you lean back in your chair. It’s surprisingly accurate, and certainly a cool application for extra security. Designers with a home office probably won’t be all that interested in Airlock, but those stuck in a shared office space could be; the app could prevent unwanted computer use and keep your designs a little more confidential. MAMP is one of the most useful Mac applications out there for designers. An abbreviated form of “Macintosh, Apache, Mysql and PHP,” this app lets designers and developers set up a local server for testing, tweaking, and optimizing their websites, online applications, or server databases. We’re big fans of MAMP – it’s one of the best apps out there for working on design projects without an active connection. Whether you need to modify a WordPress theme on the go or simply test your website without fear of crippling the server, this is the app to do it in. MAMP itself is free of charge, while its bigger brother MAMP Pro is available from $49. Don’t like searching? Launchbar 5 is one of the few apps that improves on Snow Leopard’s already impressive search features. Install it and you’ll be hit with one of the most versatile productivity and file management platforms out there – LaunchBar gives users complete access to Quick Look, their favorite applications, and search options for their clipboard history and system files. It’s one of those applications that seem unnecessary, right until you install it. If you’re accustomed to wasting time switching between applications and searching for development data, install LaunchBar and enjoy quick, simple, and effortless productivity. xScope is one of those apps that should install automatically once you start a design project. The app itself is a simple and highly useful collection of design and project double-checking utilities, including a series of on-screen rulers for checking that designs are smooth and in synch, a screen resolution tester for testing websites on different monitor sizes, and a color checker. But there’s more to xScope than just checking projects before completion. The application is built for designers and web developers that are tired of wasting time recording information by hand. If you want to minimize the amount of time spent checking over specific details and recording site information, xScope is worth its meager $27 purchase price. Every developer needs a go-to file transfer application, and Mac users have two excellent and very different choices. Flow is the first – a file transfer application that’s stunningly beautiful, powerful enough for most design and development tasks, and compatible with all major web protocols. It’s priced at $25 and worth every penny, provided you’re the type that prefers a great interface to an endless list of features. The second option is Cyberduck – a versatile, powerful, and surprisingly usable open source FTP application. If you’re less concerned with pure usability and more interested in power, compatibility, and all-round usage, we’d give Cyberduck the recommendation. As an open source application it’s free of charge, although the developers would surely welcome a donation. There are plenty of productivity applications out there for Mac users, most of which are loaded with excess features and bloated to the point of worthlessness. ShoveBox is the exact opposite – a clean and simple note taking tool that lets designers, developers, and online workers quickly store and reference important data, images, and entire websites. If you need to take hundreds of small minor notes each week, incorporate Shovebox into your work strategy and watch previously wasted time reappear. It’s our favorite all-purpose productivity app for the Mac because of its simplicity – users can drag information to ShoveBox without any extra commands or wasted time. Check out the website and you’ll find a 30-day trial, with options to purchase for $24.95. Professionalism is everything when you’re a designer, especially if you want to position yourself as a premium provider and a leading design firm. While Paypal invoices and rough emails are enough for your minor clients and close friends, it’s worth investing in a proper invoicing application when billing to major clients and large companies. Blinksale is our personal favorite due to its simplicity, low price, and lengthy list of existing invoice templates. Invoices can be customized to use your own company’s logo and marketing messages, or even completely outfitted with different CSS and layout data. Whether you need to send a monthly reminder or wish to completely automate credit card processing, this is the online app to use. Isolator is a simple application that lets you do one thing: focus on doing one thing. Users can block out needless distractions and configure Isolator to limit their Mac’s attention to the active window, cutting out needless fiddling and helping to get things done. While not particularly useful for design on its own, it’s one of the most lucrative free applications we’ve found for designers that just can’t focus without a little push. The app itself is a small, unobtrusive square that sits in OSX’s menu bar. Click it and you’ll switch it on, limiting your focus to a single task and (hopefully) helping you get more done. If you’re a sucker for distractions, Isolator is a must-have addition to your Mac. Things is a task manager with a difference – one of the few time and project management apps that actually helps users get more individual tasks done, offering both traditional to-do lists and a more in-depth interface for managing personal and business tasks. It’s clean, collaboration-friendly, and freely able to synchronize with your iPhone or iPad. If you work alongside a team of designers, developers, or artists, Things is a must-have addition to your digital workspace. 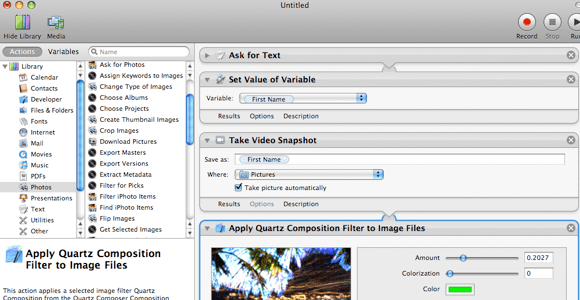 Projects are organized similarly to files in Snow Leopard’s sidebar, giving frequent OSX users a quick and familiar interface for organizing tasks. Single-user licenses are just $49.95, while multi-user packages start from $74.95. There’s nothing less interesting than scrolling through style sheets in a text editor. CSSEdit is one of the best Mac development applications out there, offering designers and web developers a different choice for styling websites and modifying CMS themes. Use the X-Ray feature to tag and check on-page elements, or simply use CSSEdit’s clean and feature laden text workspace to edit page style. Pair CSSEdit with TextMate and you’ll end up with the Mac’s most intuitive code and style sheet editing suite. A demo version is available with a few limitations (files are limited to 2500 characters and editing options are slightly restricted), and the application itself is available to purchase for $39. Mac Users: Do you know any must-have design apps? Our fifteen-part lineup covers the major bases for Mac users, but it’s far from a complete collection. If you know a certain must-have design, development, productivity, or collaboration application for Mac OSX, feel free to let us know in the comments section. No app is too small – desktop utilities, iPhone applications, and online tools are all welcome. This entry was posted on Friday, August 27th, 2010 at 17:49 and is filed under Articles. You can follow any responses to this entry through the RSS 2.0 feed. You can leave a response, or trackback from your own site. Nice article, and surprisingly, a few apps I hadn’t heard of before (which is quite a rare thing these days!). Inspiration is a big thing when designing, and subsequently, I use RSS feeds a lot. NetNewsWire is my RSS Reader of choice. Coda is a great code editor and FTP client, as well as sporting one of the nicest icons around. Tons of applications, files and resources can put strain on your hard-drive occasionally, so then I turn to CleanMyMac, which does the job perfectly, but also looks great. I personally think transmit is the best mac FTP client, especially with the recent update, but either way great list and def have some ones to check out that I hadn’t heard of. i agree with joshua, transmit is by far my favorite ftp program. ive tried a few other since installing it, but nothing has convinced me to make a permanent switch. the free version allows you to be connected for 10 or 15 minutes i think, before disconnecting. while i definitely could have made do with constantly reconnecting (i did for like 3 months) i eventually bought it, when it proved to be better than any other program i could find. and to go along with conor bringing up rss readers… i use netvibes, and its pretty unbelievable! different tabs divide up the types of blogs i follow, with each tab laid out magazine-style… i especially like the slideshow display (works great for design sites that i just want to see the newest image posted). Ohh and where is coda and text expander? its articles like this without repetitive same nonsense that makes your blog great. thanks for this. i never use automator, but i’m going to give it another go.